Some of my padook friends believe (or guess) that tengen is the best move as Black's first play. Although most padook players (including pros) are reluctant to play tengen for their first move, it seems that tengen is attractive to at least some people's intuition. Presently, nobody can show which opening play is best. So, asking pros which move is best in the opening is actually considered as a kind of joke in the Go world (at least in Korea). I have seen for a long time that many Go players, especially beginners, don't have a correct understanding of the reasons why corner plays in opening are common and are regarded as "reasonable moves" (although we can not be sure if corner play is really better than tengen). The following contains some explanations on merits and demerits of tengen (including center oriented plays) and corner plays which you should know. Perhaps these explanations sound too abstract, or are not easy to follow. If so, don't worry and forget about it. As your rank goes up you will understand it more easily. 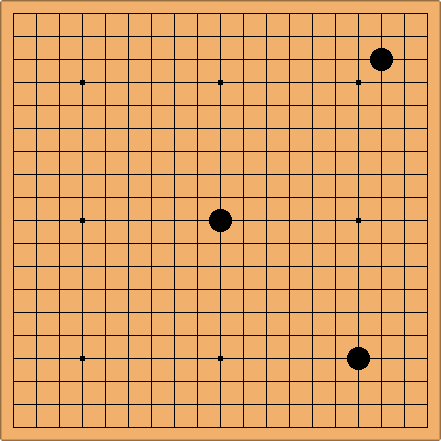 Thus, in this view, territory is just a shortcut (or fast and convenient way) for measuring how much and how well your stones succeeded in controlling the board. In other words, secured territory is nothing but a by-product of the "strength of stones". If your stones are organized in a way in which the positions are stronger and more efficient than the opponent's stones then territory will be made naturally and "automatically". So, the life of stones is more important than just making secured territories. Survival of stones is the first thing to care about, territory is the second thing. "Urgent moves" are more important than "big moves for making territory only". In this view, the center is better than the side, and for the same reason, the side is better than the corner. In other words, considering just the fast development of stones, plays in center are best. If so, why are corner plays so common and the standard way of opening? It's because of survival of stones. Why? Because we can make a base for our stones much more easily in the corners than on the sides or in the center. Thus, the main and basic reason of getting corners is making solid and stable bridgeheads to develop into the sides and the center without worrying about the life of our stones, not for taking the corner territory. Let's summarize: for just fast development of stones, the center is surely better than the corners. But the disadvantage of the center is the difficulty of making a base there. Stones in the center without connection to a side or corner are like trees with no roots. It is hard to settle them easily and as a result we will have trouble forming solid positions of such stones. Now, time to evaluate 3 moves in opening (3-3, hoshi, and tengen) considering their own attributes. The 3-3 point is best at making a solid and stable base fast. But, due to its low position, it is weak at development to side and center. Generally speaking, 3rd line moves are good at making a solid base. Hoshi (the 4-4 point) is a more center oriented move than the 3-3 point. So this move is much better for fast development to the sides and center but worse for making a base in the corner than the 3-3. Traditionally, the fourth line is said to be the "influence line" (simply speaking, "influence" is another word for "potential of development of stones"). Tengen is best choice for speed of development, but a much thinner move compared to corner plays.